“In the fall of 1944 a group of soldiers from a machine gun unit of the National Liberation Army came to the Lower Monastery and picked corn from the monastery field. That year a famine had struck the entire region and the crops were very poor, but whatever there was had to be available for the military. Having taken the corn to their barracks, the soldiers proceeded with their drills. They erected a machine gun in front of the Lower Monastery from which the soldiers shot at a target. They had been firing shots and stretched ammunition belts the whole day when suddenly the machine gun jammed and could not fire a single shot. The soldiers spent an hour trying to fix the gun and to pry out the jammed bullets, without any success. Finally, the soldier N.S., who had commanded the others to take the corn from the monastery, walked up in order to fix the machine gun. There was no one near the gun at the moment when he stood in front of the barrel. Suddenly there was a blast and the man fell to the ground, dead. Hieromonk Seraphim Kasic wrote down the testimony of Njegosava Celebic from the village of Goricani (Zeta) on June 30th 1963. The testimony is signed by Njegosava Celebic, Prenta Arapovic, Danica Batricevic, Andja Pantovic, Stanka Juncaj and Camaj Filja. It was in 1947 that I came with my little daughter Persa to bow down before the relics of St. Basil of Ostrog and to pray. After the keeper of the holy reliquary had opened the church for us, we went in and venerated the relics, prayed for a while and then went out. I went down to her and to my joy saw that there was not even a scratch on her. Her dress, though, was thorn to shreds. I turned to St. Basil in prayer and thanked him for having saved my child. I promised, while still standing at the place where my daughter had fallen, to buy a kilogram of incense for the monastery. Glory be to God for all things, I received the incense from England and here I am, back at Ostrog, to fulfill my promise. I have never ceased praying to God and St. Basil and asking for their protection." “Until the year 1948 my faith in God and in the existence of a spiritual realm was very weak, unsure and unstable. Here is what made me change my mind about these things. While working on the construction of the Niksic – Podgorica railway line in 1948, I went home to rest for a few days. My wife told me that she intended to go to the Ostrog monastery to pray to the health and the health of our family. I tried to dissuade her from going, but she was very persistent and wanted to go as soon as possible, because of some dream she had had some time ago. Finally we agreed to travel together to the railroad construction site, from where she should go on by herself to Ostrog, which was not very far from the site. My wife filled two bottles with home-made plum brandy for me to take to my companions at the construction site. She filled the third bottle of the same size with olive oil for the Upper Monastery vigil lamps. We set off, carrying the bottles in a bag, and stepped off the train at the Ostrog station. While we were stepping off the train, I lost my balance and slipped. The bag with the bottles fell on the hard stone pavement and the bottles broke. To our amazement, when we looked inside the bag, one bottle was intact – the one with the olive oil. The other two were smashed and the brandy had all poured out. This made me think twice and I decided on the spot to join my wife on her pilgrimage. We went the following day, left the oil there as a gift and venerated the holy relics. We stayed for vespers and prayed. "In 1948 I was employed at the Ostrog railway station. One day while I was standing on the platform with several of my fellow workers, an army officer arrived at the station with his wife, who was carrying a beautiful baby girl in her arms. The officer told us what had brought him to Ostrog. A son had been born to them in 1946. One night he had had a dream in which an old man had come to him and had told him to have the child baptized at the Ostrog monastery. He had paid no attention to the dream and five days later his son had died. Another son was born in 1947 and the same old man appeared to him in a dream telling him to baptize the child. Again he disobeyed and two days later the child died. “During my visit to Ostrog in July 1949 I witnessed a remarkable incident that I have not been able to forget ever since. I had venerated the Relics of St.Basil together with a group of four young men who had come to the Upper Monastery from a nearby railway construction site. There was also a woman who was going to enter the little church with us, but as she crossed the threshold, we all heard and felt the rock tremble violently, as though it was going to crash down on the monastery. The monk who was in the church told the woman to leave, as soon as she had gone away from the church the tremor, which was very much like that caused by an earthquake, stopped. She tried to come back into the church three times and three times the rock shook and did not allow her to enter the holy place. The monk then told the woman to go to the Lower Monastery for confession. In the meantime we went into the church. "M.B., a hard-working woman from the village of O., municipality of Bar, never took much notice of feast days and celebrations of God’s Saints. She took pride in doing her work on Sundays and feast days, working even harder then on ordinary days. Many of her neighbors tried to dissuade her from doing so but she would not listen. One Sunday she baked bread and went to gather firewood near her house. As she bent down to gather the branches a snake threw itself on her head from a nearby bush and stayed there. She screamed and ran home, where she tried to shake the snake off, but neither she nor her neighbors could take the snake off her head. To make things worse, nobody could even see a snake on her head. She decided to seek help at Ostrog and to pray to God to deliver her from this plague. While she was walking through the dense forest between the Lower and the Upper Monastery, the snake suddenly jumped off and hid in the bushes. She continued on her way and spent the night at the Upper Monastery. The next day, while she was passing through the forest on her way back, the same snake shot out of the bushes and draped itself around her head again. “I had been very pious all my life. I believed in God and honored His Saints. I led a happy family life until one day everything changed: I lost my only son and all of my grandchildren and I was left alone with my husband. To make matters worse, our cattle died and I was thrown into despair. My nerves were on edge and I nearly lost my wits. I stopped going to church and for seven years I neither prayed nor partook of the Holy Mysteries. I complained and insulted God, asking why He had let all of these bad things happen to me. I considered my life was over and I awaited the day when they would put me in a mental institution. One night St. Basil of Ostrog came to me in a dream. He told me not to lose hope and faith and that God in His great mercy would save me and help me. He said that he, Saint Basil, would be my protector always. When I woke up, I felt more at peace, encouraged to go on with my life. The desire to pray reawakened in me. I felt like a different person. “Four of my friends and I went to Ostrog in September of 1949. I wished to ask the monks to serve a panikhida for the departed members of my family. My friends went for the same reason. We took six large bottles of olive oil for the monastery vigil lamps. We took turns balancing a large basket with the bottles on our heads. We arrived at the Ostrog train station in the late afternoon because the train was delayed. There were a few other men and women who got off at Ostrog and walked with us in the direction of the monastery. It was already getting dark as we walked uphill along the winding mountain road. After about half an hour we saw that we were lost. Feeling our way about in the moonless night, we stumbled upon a steep rocky gorge. I was carrying the basket with the bottles of oil on my head. Suddenly, I lost my balance and slipped, sliding and tumbling into a creek about 5 meters deep. The bottles rolled out into the bushes and I remained lying in the creek, stunned, for several moments. One of our companions helped me up, asking if I had broken any bones. Remarkably, I had not even bruised myself while falling, as though I had fallen on a soft carpet. We found that although all the bottles of oil were scattered around the creek not one was broken, so we picked them up and took them to the monastery. “For a long time there was no peace at our house because things were not going well for me and my husband, who was a state employee. One night in 1950 I had this dream: I was walking uphill through a forest when I met a thin old monk who looked at me and said, “You are very worried and tense. You must not fall into despair. Pray to God and St.Basil of Ostrog and you will find help!” Then he gave me a green cup filled with water and went his way. Next I met a woman with a child in her arms. I gave the child a drink from the cup the monk had given me and then woke up. Thinking about my dream, I felt encouraged and my soul was filled with a quiet joy. “A great many workers from the surrounding villages worked on the construction of the new Niksic-Titograd (Podgorica) railway line. They worked with the enthusiasm, clearing up the rocky terrain and building the “Road to Progress”, as the authorities had named it. Not far from the Ostrog monastery, in 1950, there worked a group of men of whom several where regular visitors to the monastery, although their piety was frowned upon by their superiors. One Sunday, while the workers were resting in front of their barracks, this small group of pilgrims decided to go to the monastery for Holy Liturgy. They stayed a little longer than they had planned and were late coming back to the barracks for lunch. When they went into the barracks some of their colleagues started mocking them, saying: “No lunch for you today! Let God and St.Basil give you lunch!” A certain Spiro M. from Bar was the loudest. He swore and blasphemed, using the foulest words to describe holy places and Christians. The pilgrims asked him to stop, saying they did not mind being left without lunch. 'We are spiritually satisfied,' they told the others. While they were talking a large rock flew in from nowhere and hit the blasphemer in the chest. He fell to the ground dead. Everyone gathered around and looked at the dead man and the rock. They were stunned, as there had been no dynamite explosions nearby the whole day. The only explosion had taken place in a quarry that was about a kilometer away from the place of the tragedy. “In 1948 I started having epileptic attacks. The attacks were very frequent and I sometimes had several a day. This was very debilitating and I sought help at several clinics. I also contacted spiritual healers, a psychic, a Muslim hodja and some herbalists. Of course none of this helped. I was also becoming mentally unstable and I started having suicidal thoughts. And then in 1952 I had a dream. In my dream I saw the reliquary of St. Basil and heard a voice say, 'Drago, go to Ostrog to venerate St. Basil’s relics; only he can help you.' I was complete atheist at the time and decided to ignore this dream. Soon afterwards I had the same dream again, only this time the voice told me, 'Do not doubt, Drago! Go to Ostrog. There is a true Saint there who is merciful to all who cry out to him for help. He has saved many a wretched one from disease, insanity and pain.' This time I obeyed. I went to Ostrog that same year, accompanied by my brother. As soon as we had entered the reliquary church, I felt better. Later, I came back by myself to give thanks. My life had changed for the better. Earlier on the doctors had advised me against marrying for, as they said, there was a strong possibility of my children inheriting the same disorder I was suffering from. However, I had another dream in which I heard the same voice say to me, 'Drago, you have Saint Basil’s blessing to marry!' And so I married and now I have a little son who is already two years old. This is my forth time at the monastery. I have come to give thanks to Saint Basil for delivering me from a condition which had threatened to destroy my life. I will always pray to him and I will visit the monastery whenever I can." “I was very ill for a few days. The disease left me crippled in my whole body and I was completely disabled; I could not go anywhere by myself. My family took me from clinic to clinic but my condition was hopeless. One night in the spring of 1952 I had a dream in which someone told me that I should go to the Ostrog monastery and that I would be healed there. However, my husband would not allow me to go to Ostrog. Finally, after my neighbors begged him to let me go, he relented and allowed me to go one afternoon on the condition that I return the following morning. And so I went with two neighbors accompanying me. It was a strenuous trip for I was not able to support myself or even stand on my feet, let alone walk even one step. Prayers were read for me at the church. I left a gift on the Reliquary of Saint Basil: a few gold coins from my necklace. When I woke up the following morning I was healed! Deeply grateful to God and Saint Basil, I went back home in joy. “Savo Vukosavljevic from the village of Sotonici, municipality of Bar, had lived and worked in the USA for many years. He retired recently and came back to live in his native village. In December of 1954 he decided to fulfill his wish of a lifetime and visit the Monastery of Ostrog to pray to God and His Saint, the Holy Basil, Wonderworker of Ostrog. On the train from Podgorica to Ostrog he shared the compartment with a man who was also on his way to Ostrog with his wife and two unbaptized children. “I set out for Ostrog with three friends of mine. Some devout neighbors from our village gave us donations to take to Ostrog for lighting candles for them before the Relics of Saint Basil. I put all this money in a separate place in my purse intending to spend it as my neighbors had said. When we came to the train station and boarded our train, another neighbor came running and gave me a hundred dinar bill as a donation to the monastery. The train started moving, she got off and I put the money into my pocket. However, when we reached Ostrog I gave all the money that was in my purse to the monks and forgot all about the money that was in my pocket. When I had venerated the Relics and was about to leave the church, I suddenly froze right beside the church door. I could not move an inch. It was as though some unseen force holding me. My friends called me, urging me to hurry on, but I was fixed to the spot. One of them came back to see why I was just standing there and when I told her, she went into the church and asked the monk to come out. The monk asked me if perhaps I had forgotten to leave someone’s donation. It was then that I remembered the money in my pocket. I went back into the church and left the money on the Reliquary. Then I caught up with my friends and went home." “While I was living on our farm in Montenegro my parents talked me into marrying a young teacher from our village school. I obeyed my parents and married him against my will. After one year a son was born to us. Disappointed by my marriage, I decided to leave my husband. One night when the baby was sleeping in his cot I left home, never to return. My husband begged me, through my parents and some friends, to return for the sake of the baby, but I refused to even consider going back. Some neighbors took care of my baby and fed it but it died very soon. Feelings of guilt soon began to consume me; I had personality brought about the death of a human being, a child of my own womb. These thoughts gave me no peace. My husband found a new wife and had beautiful healthy children with her, but I remained single for a long time. Finally, I, too, met a good man whom I married and with whom I am now living a very happy life. I had four premature births. None of the children lived in spite of the expert care of neonatologists at the Belgrade hospital. Deep down in my soul I felt that I was being justly punished by God for having abandoned my first child. “One day a young woman, a native of Boka Kotorska living in Belgrade, came to Ostrog. She worked for a large company, her husband held an important position as a lawyer and they were quite well off. We met in the front of the monastery gates and spent some time talking. She complained of physical exhaustion and depression for which doctors could find neither cause nor cure. She was irritable and despondent. She confided in me that earlier that year she had terminated a pregnancy in a Belgrade abortion clinic and that since then she had felt no peace. She said she had come to Ostrog to confess her sin and to pray for forgiveness. Soon after the abortion she had had the following dream: she was walking up a hill not far from her house. A little boy ran in front of her, crying 'Mother, mother, what have you done to me?' When she reached the top of the hill the child suddenly fell into a crevice and screamed, begging her to come and rescue him. She looked into the hole and saw the child, blood gushing out of his wounds. Feelings of maternal love and tenderness overcame her as she tried to pulled him out of the hole. The child’s anguish was unbearable. She looked around for someone to help her pull the child out of the hole but all in vain. She woke up crying. Later she asked the physician who had performed the abortion on her whether the fetus had been a male or a female one. It had been a male. A great sadness came over her then, for she understood her sin and was convinced that God would punish her and that she would have no more children. 'Father, I am a drunk – a great and notorious drunk. Anything I earn, any cash I happen to have on me, I spend on alcohol. To make a long story short, and I want to say this here before Saint Basil, I live a dirty life. Besides myself, those who suffer most are my family, my closest of kin. I have never heeded any advice until now. The day before yesterday I came home in the evening, drunk as usual, and fell into bed. That night (I may have been dreaming or I may have been awake, I cannot say), Saint Basil himself came to me and said, “Why are you doing this? Why do you waste your life drinking? Repent! Go to Ostrog and make a solemn promise before my relics that you will not drink any more.” As he said these words, he disappeared. His mother and I were overjoyed at his words. I congratulated him on his decision and warned him to keep the promise he had given till the end of his earthly life. He thanked me profusely. My wife, too, wept for joy by my mother’s side, while I sobbed and cried like a child. It is a feeling hard to describe. We are going home now, Father. I will say this once more: I will keep the oath I gave before the relics of Saint Basil. 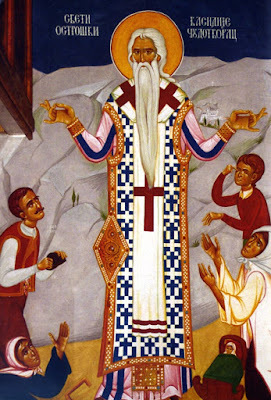 A new life has begun in me since the night Saint Basil came to me in a dream, glory to him (he turned towards the church and crossed himself). It is as though something deep inside me was consumed by fire and a new good seed was planted in my heart. I feel somehow invigorated and full of inexplicable joy. To this I replied, 'And with you, too. May you have a safe and happy journey home. 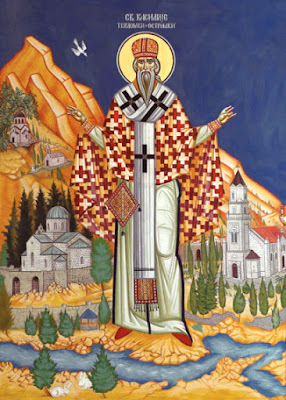 May God and Saint Basil always help you and protect you!'" “Each year, on the eye of the Feast of St. Luke, an elderly man could be seen at Ostrog. He was tall and in an excellent physical shape and bore the burden of his eighty years well on his still powerful frame. This eighty-year old came to Ostrog whenever he could to pray to God, but he was always there on the day before the Feast of St.Luke and St. Petar of Cetinje. 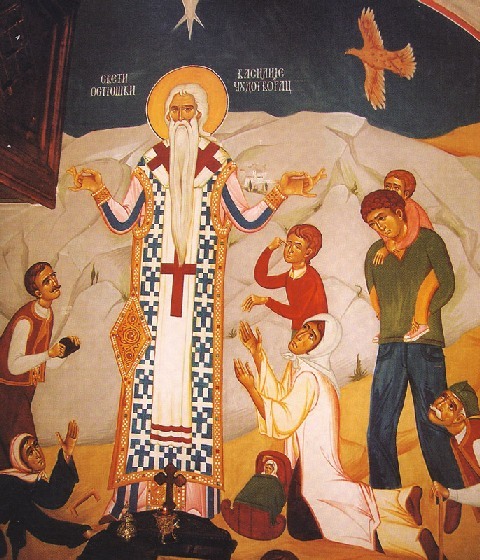 On that day he would approach the Reliquary of St.Basil with piety and prayer to give thanks to the Saint for having healed him and having brought him to the Faith. This man was Petar Koprivica, a well known and respected family man who in his youth had been severely crippled. 'In my youth I had very “progressive” ideas. I did not believe in anything, let alone God and His Saints and the Wonderworkers. As the Communist Party was illegal in those days, I was a secret sympathizer. I ridiculed the name of God and anything holy. I had no fear of God in anything I did or said in secret, or in public. However, the Almighty God did not permit me to remain in this terrible godless state. In January 1920 I became seriously ill. My illness was unbearable, not only for me but for my whole family as well. Instead of turning to God in my suffering I swore and blasphemed even more. In vain did my parents and my brothers and sisters warn me against uttering these terrible obscenities. My illness went from bad to worse until I became a useless cripple. I could not even sit or stand up straight let alone walk. In vain were all my efforts to find a doctor or an herbalist who could help me. There was no help. My illness was incurable. I was close to despair. My family had lost all hope that I would ever be cured, but they never ceased to implore me to seek help at the Ostrog monastery. While I was still able to bear my pain I rejected their advice, for I did not believe such things. But as the pain got worse and I was completely bed-ridden, I finally agreed to go. With great difficulty my brother Luka brought me to Ostrog on this very day fifty years ago. I went into the church and venerated the relics. Afterwards they took me outside. A young hieromonk, Father Boris (Kazhanegra), who later was abbot of the Praskavica Monastery and at that time was keeper of the Relics, consoled me by saying that God and St. Basil would give me the gift of health if my prayers were sincere and my faith strong. Then he read prayers for my health and served vespers. I spent the night in the church and, to my joy, I felt much better that very night. The following day I went down to the Lower Monastery, where Father Jovan Damjanovic and Hieromonk Teofilo (Popovic) from the Piperi monastery performed the service of Unction. Upon my return home to Niksic my pain was considerably less. Everything went well for a few days, until one day I went into the workshop and saw that my younger brother Djordje had made a mistake at work. Still adhering to my former habits, I scolded my brother and shouted obscenities at him, insulting the name of God and His Saints. At that very moment I was seized by pain more severe than before I had gone on my pilgrimage to Ostrog. I wept bitterly and beat my breast because I blasphemed against God and His Saints and against His mercy. I had finally understood that God does exist, a God who both chastises and rewards us. But now my tears were not enough any more to wash away my great sin. My condition worsened from day to day and again I was thrown into despair. Four long months passed. My nerves seemed to be on fire. I had a feeling that something deep inside me was on fire, too. The inflammation of the nerves crippled me to the extent that my head was touching my knees. It was spring and I felt irresistible desire to go to Ostrog again. My family also wanted me to go. As soon as warmer weather set in my younger brother Filip put me on a horse and on the evening on the First Saturday of Great Lent, the Saturday of St. Theodore, we arrived at the Upper Monastery. And again the hieromonk Boris read prayers for me and served vespers. The following day was the First Sunday of the Lenten Fast, so my brother took me down to the Lower monastery for Holy Liturgy, which was served by Abbot Leontije (Mitrovic) who gave me Holy Communion. After this, thanks be to God for His abundant mercy, the pain died down. I started walking a little. This fuelled my desire and gave me strength to visit the Zhdrebaonik monastery in order to venerate the Relics of St.Arsenije, Serbian Archibishop and Wonderworker and ask also for his prayers. God was good and I was able to fulfil my wish, through the prayers of the Very Rev. Father Srdjan Popovic, who welcomed us and offered us his warm hospitality at the monastery. After my visit to the Zhdrebaonik monastery I went home. The pain did not vanish completely but now it was quite bearable. Moreover, I guarded my tongue carefully lest I again insult the name of God or anger Him in any other way. I never again doubted the mercy and the wrath of God. I tried to live by the Law of God. I kept all the fasts, I went to church regularly and I asked the priests for their prayers and advice. As my life became more God-orientated so did my health improve, but I still could not stand up straight. 'Yes. When the old monastery burned down the third day after Pentecost I was in Gacko, building a house for Obren Vukovic and when I heard about the fire I was overcome with sadness and grief. I hid and cried like a little child for its mother and could find no peace. I could not wait to see the remains of the burned down monastery and to venerate the Relics. When I arrived I found ten workmen who were clearing up the rubble and preparing the foundation for rebuilding the monastery. It was then that the desire to build something with my own hands came upon me. I wished to make a gift to the monastery as a token of thanks for my healing. I begged the abbot of the monastery, Father Leontije, to allow me to build something for the Upper Monastery with my own hands. At last he gave me his blessing and on St.Vitus’ Day my younger brother Djordje and I brought our tools and building materials and we built that iron gate that you can see…My brother also helped me with some stonecutting work and carpentry that I did for the monastery in 1926. in October of 1926 my brother went home, for he was getting married, and I stayed on in this House of God and performed all kinds of building and repair jobs. During my stay at this Holy Place I witnessed many miracles. I have told some of them to the monastery archivist,' said Uncle Petar, finishing his story."